There is nothing in this world like watching someone develop over many years and become masters at something. 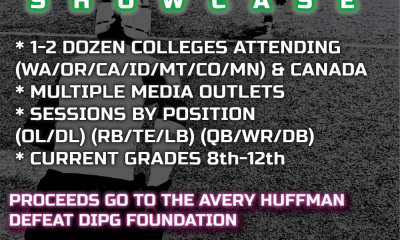 As a Coach and a writer/analyst in the Prep Football space, I have been fortunate to watch hundreds of athletes I have coached, mentored, and written about go on to play college football, many of them are now in the NFL. How great is that! 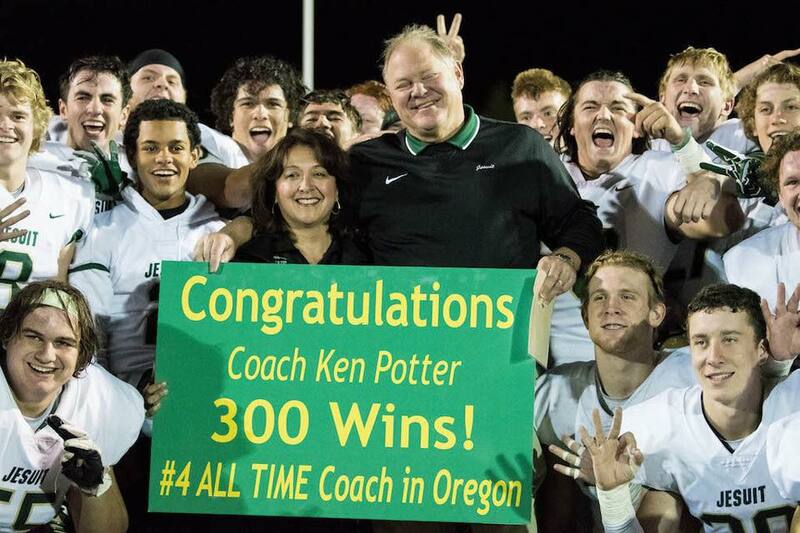 Coach Potter at Jesuit (Portland) moved past his 300th Win recently and made history. Many of the players who have helped him make that possible are a part of our NW Football Family. Here is a mention about two of them. The Stars were always going to be stars. They have that special mix of speed and athleticism to make it but that does not mean our help was not important. Never a day goes by that I do not smile seeing some of these guys post about beating the Seahawks or Steelers or the Ducks or Ole’ Miss. Equally if not more rewarding is the opportunity to stay in touch with and support the young men who had to work even harder than those who were superbly gifted. 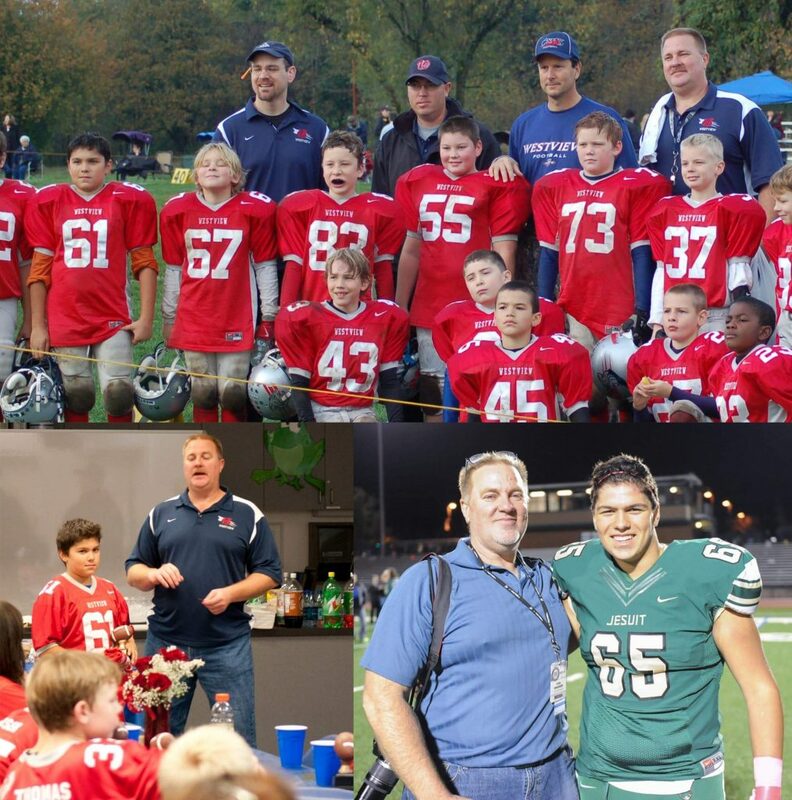 Kids who are a couple inches shorter or not quite as fast- I am talking about the 95% of all football players. This Friday as I watched the game highlights on Channel 2 at 11:30 PM I got a glimpse at one of the toughest kids I ever coached and celebrated as he did his thing. Grabbing a North Medford pass after dropping back into coverage was Jesuit High Schools Thomas “Blake” Baldocchi. He snagged that pass and headed North to the end zone and scored. 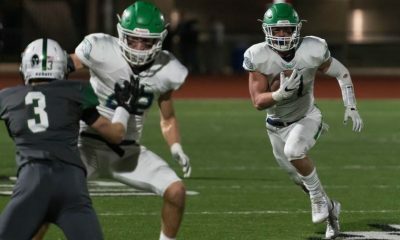 From his Linebacker spot, the 5’11”- 185 lb Crusader is as fierce as they come. He always has been. It was my good fortune to Coach him as a youth player in the Westview system. Back in those days, he won us a lot of games- we were good and won more than we ever lost and Blake was a big part of that starting both ways. His stepfather, William “Bill” Pollock was a regular on our staff. He brought a professional manner and demeanor about him and he supported me as a Coach and a friend in a way that I needed- often he reminded me of a play we ran (and we ran the Playstation Offense) and would point out the kids needing help. He was my eyes and a tireless supporter in those days. Blake is one of the strongest kids I know on and off the field. In the last 3 years, he has lived through a fire that burned the families home down in Oak Hills and the death of Bill. They lost the house and rebuilt it stick by stick as a family. They lost Bill to Cancer this past year and that they can not rebuild. We all miss him dearly as he left a huge footprint that no one is ever meant to replace. 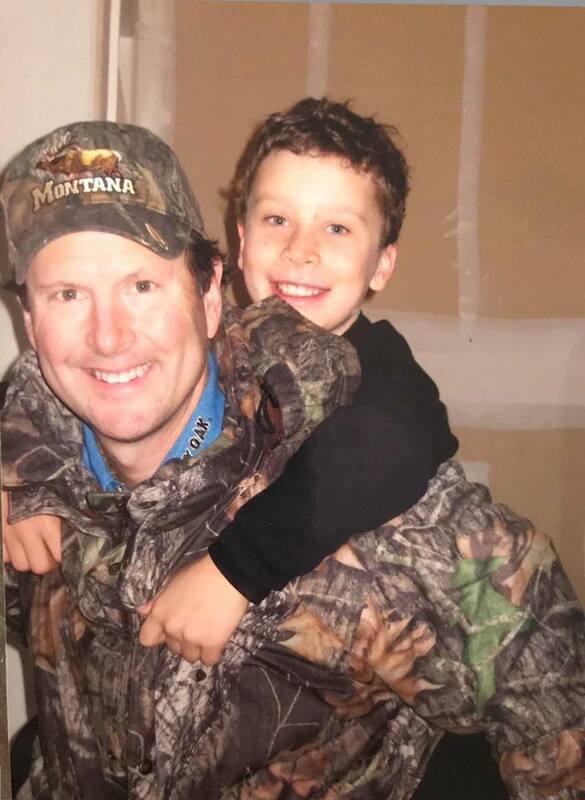 Seen here as a young gun is Blake Baldocchi on the shoulder of William “Bill” Pollock, his Step-Father, who we will always miss forever. A great man, Husband/Father, and Coach to us all. When Blake crossed that goal line Friday Nigth and got in on a sack or two I already knew Bill was there in the end zone cheering him on. This was a moment shared by all of us who realized the importance of what it meant. I sat in my chair at home watching that Pick 6 with satisfaction and admiration. I closed my eyes and remembered years spent together and that was a moment of moments- one I will never forget. 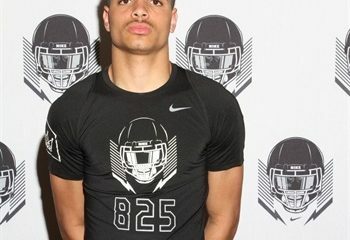 Catch that play and some of Blake’s Highlights here Coaches- this kid is a winner! Our hearts and prayers go out to Bill’s wife and SUPER-MOM – Desiree; and of course the entire family. Life is so short and so precious. Bill lived it the way few have ever done. 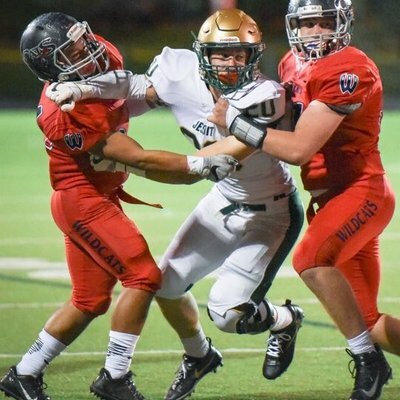 Also on those highlights, I picked out another player from that same youth team who has also been making quite an impact on the field and that is Jesuit linemen Cameron Mahoney. Cam was one of the most coachable players I ever had. With a passion to learn and a winning attitude not a day went by that I could not count on him to set the standards. He was a bigger kid as a youth player than most but did not dominate until he was in the game a few years. As his body came around it was clear that this student of the game was made to be a part of it- and a big part as it turns out. 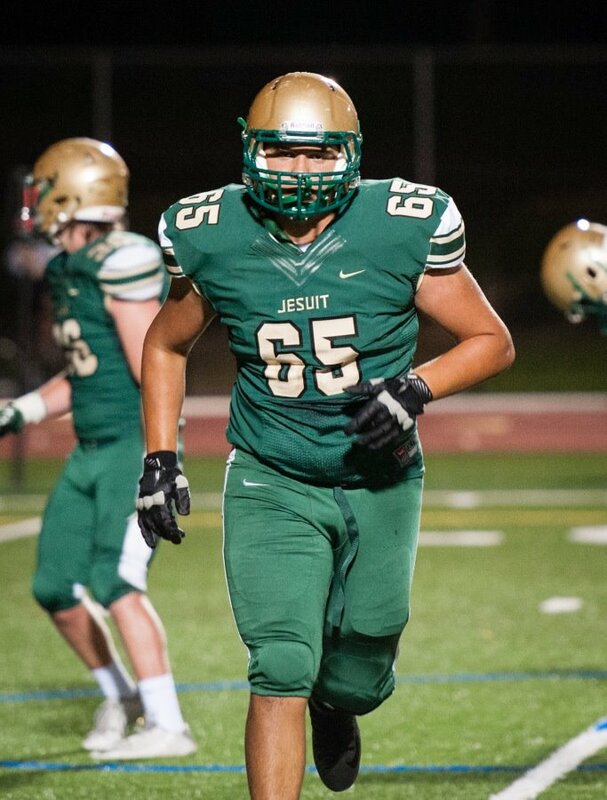 This season he is burying opposing Defensive players as the Right Tackle for the highly ranked Crusaders. 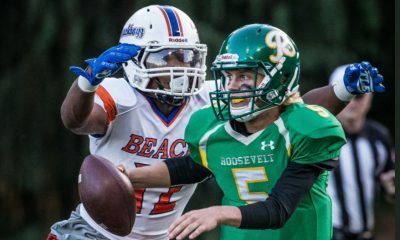 His film, which you will find here, not to mention his grades and a big frame (6’3″-255 lbs) was enough to impress Moorehead State who has offered him a scholarship to come play football for them. They may not be the last. This kid is the real deal! I loved Coaching both of these guys. They were always winners and always competitors. It is very rewarding to be able to write this short mention of them and give them some much-deserved credit and attention. Emphatically I will state that ay school anywhere would be lucky to have these two on their teams. The fact that I got to coach them and know their terrific families is just icing on the cake for me. I love them both as my own sons and am very proud today. The greatest thing is that these are just two in hundreds I count among our NW Football Family! Thanks to all of you who have allowed me into your lives through Coaching and Writing. Stay safe, stay blessed, and Live life to the fullest! What is it…this strange dance we do while on Earth…that makes us all move forward into the darkness never quite sure where we are going while clinging to each other as We move ahead looking for the light?